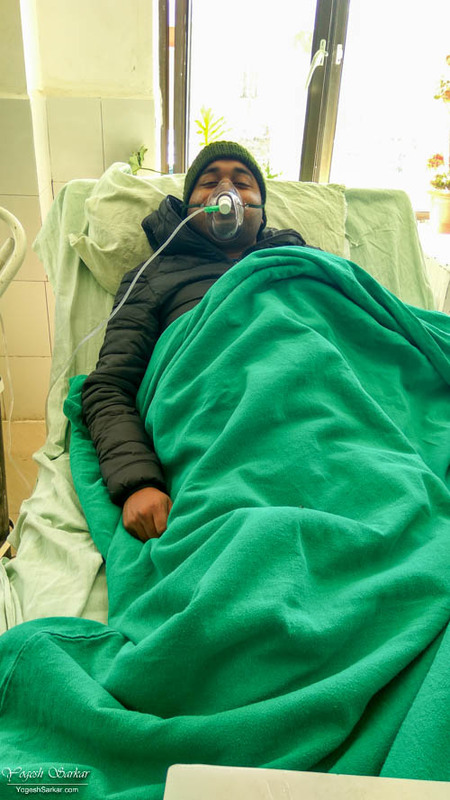 Can a person suffering from Asthma, travel to Ladakh? Last year, I was confined to my home for over a month due to Asthma. I couldn’t lie down, I couldn’t walk 10 meters without running out of breath and worse still, nothing could give me more than a momentary relief. Yet, barely 3 months after I recovered and was able to go out again, I traveled to Ladakh for the 9th time and explored it, without any issue. 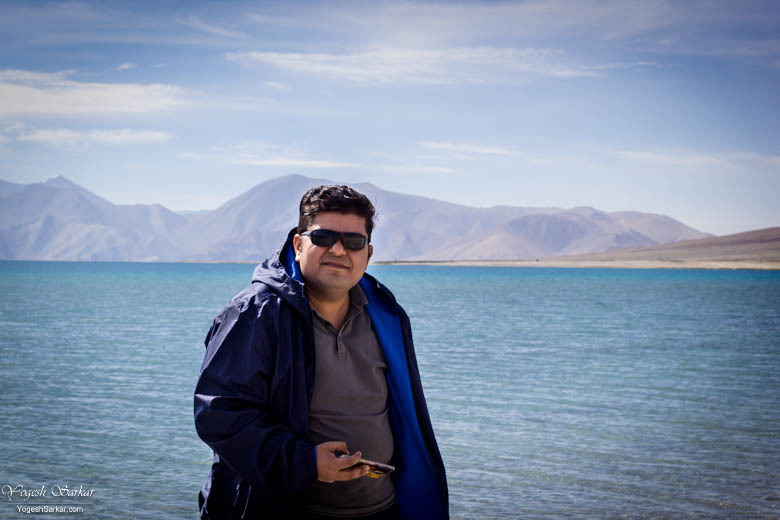 So yes, you can definitely travel to Ladakh if you have asthma and in this blog post, I will be sharing a few tips and words of wisdom about Traveling to Ladakh with Asthma, so that you or your loved ones might benefit from it. Tip 1, Get Used to Walking: Start walking on a regular basis, especially early in the morning. It will do you a world of good and build up stamina, which is essential in Ladakh. Whatever your walking capabilities in plains are, expect a dip of around 20-40% in Ladakh. So if you can’t walk for even a couple of hundred meters without running out of breath, you will have a hard time moving around within your hotel. So please start walking, now! 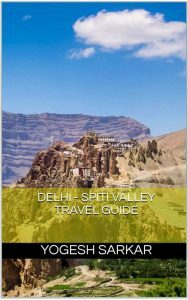 Tip 2, Stop Before You Run Out of Breath: If you run out of breath in Ladakh, it takes an extremely long duration for your lungs to relax and come back to normal breathing level. So avoid doing that and stop and rest, even before you’re about to run out of breath. Don’t push yourself for the sake of others, take it easy. 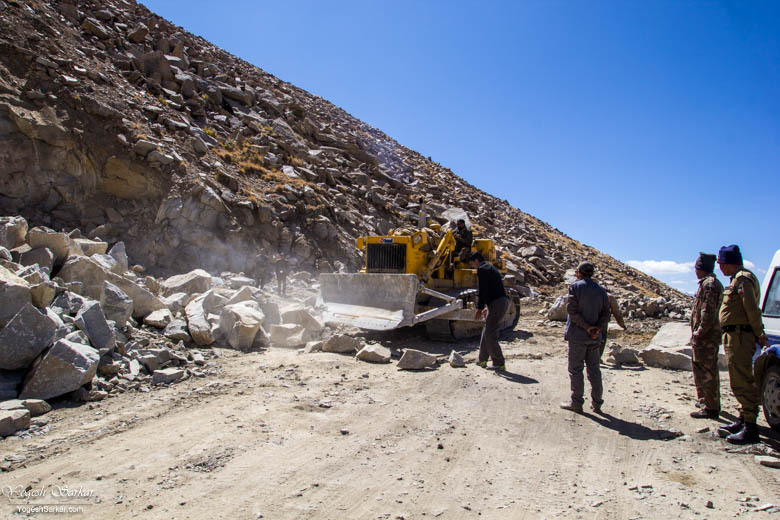 Tip 3, Wear Pollution Mask: Construction in Ladakh seems never-ending, especially when it comes to roads. And there are places where it can get extremely dusty due to it. So carry a good pollution mask (I use this 3m Pollution Mask) and keep it handy, even while sitting in a taxi. Put it on, before you reach a dusty section of the road to avoid triggering your allergies. 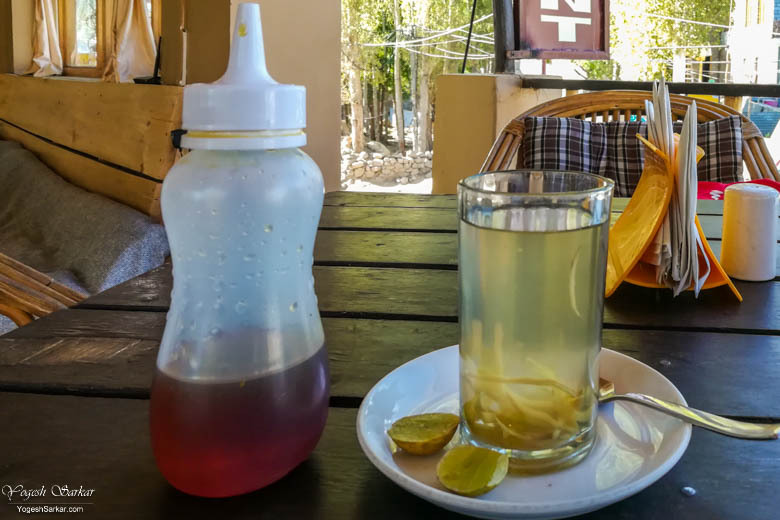 Tip 4, Ginger and Garlic: Nothing provides relief to a sore throat like Ginger Lemon Honey Tea and you will find some of the best of it in Leh! So make sure to have this healthy beverage, since it will help relax your throat. Garlic is known for its anti-inflammatory properties and is also supposed to help you acclimatize to the high altitude. Thankfully, Ladakhis put plenty of it in their food and you should try it as well. If you’re worried about bad breath, carry mouthwash. Tip 5, Eat Light: Yes that’s right, eat light and frequent meals while traveling in Ladakh. Avoid heavy and fried stuff, since they can make breathing heavy and for digestion, we need a lot of oxygen as well. This is especially true while crossing high altitude places or while staying overnight at places like Pangong Tso. Tip 6, Keep Yourself Covered: Majority of the coldness in Ladakh is due to a wind-chill factor, so make sure to keep yourself well covered, even if it seems a little hot. While crossing high altitude passes or when it is cold, keep your neck covered and warm. Tip 7, Drink Warm Water: Drinking warm water relaxes your throat even in plains. At high altitude places like Ladakh, it is all the more important to keep yourself hydrated, since dehydration can easily lead to severe AMS, which can be deadly. So carry a flask for warm water, get it filled from your hotel and restaurants, and keep drinking that water on a regular basis. Tip 8, Put Mustard Oil or Vaseline Inside Your Nose: Dry and cold winds of Ladakh causes mucus inside your nose to harden up and make breathing heavy and painful. I have found mustard oil and Vaseline to be the perfect remedy for it and I have been using them, even before I had Asthma, but used to suffer from Sinus. Tip 9, Buy a Pulse Oximeter: Pulse Oximeter can measure blood oxygen level in real time. If your oxygen level dips below 80, then you’re in need of medical attention and usually taking oxygen helps increase the blood oxygen level. However, if taking oxygen for 10-15 minutes isn’t seem to be doing any good or your blood oxygen level has fallen below 75, then rush to the nearest hospital or army base for help! Usually, it is pretty hard to guess your own condition, since the majority of us get confused due to lack of oxygen. Pulse Oximeter helps remove that confusion and isn’t all that expensive and easily available on Amazon. Some of the higher end mobile phones also come with a pulse oximeter, doing away with the need for carrying a separate device. Even though it isn’t required for Asthma, it is recommended for those visiting high altitude areas and even more so for someone already suffering from reduced lung capacity. Tip 10, Carry an Oxygen Cylinder: Irrespective of whether or not you’re suffering from Asthma, carrying an oxygen cylinder with enough oxygen for at least 30 minutes is a good idea while traveling in Ladakh. It helps reduce the effect of AMS on the body and help raise the oxygen level in your blood. You can easily buy or rent an oxygen cylinder from your city or in case you’re flying to Leh, you can rent one from Ladakh Oxygen (9419178162) in Leh. Quite a few drivers in Leh also carry oxygen cylinders these days. Tip 11, Avoid Consuming Alcohol: You should avoid consuming alcohol during the first few days of your Ladakh trip. Since alcohol dehydrates the body and increases your chance of getting hit by AMS. So avoid it, irrespective of whether or not you’re suffering from Asthma. Needless to say, you have to keep your regular and emergency medicines with you at all times, along with the prescription. So that in case of any medical emergency, you can receive proper and timely medical help. Most importantly, listen to what your body is telling you. Do not brush aside warning signs due to over-enthusiasm or in hope, it would get better on its own or in an attempt to not cause inconvenience to co-travelers. At the end of the day, life is unpredictable and thus I feel, one should enjoy it to the fullest until we can. Of course, this is just my personal opinion and the above tips are from my personal experience. They should not be confused with medical advice, especially since I am neither a doctor nor an expert in Asthma. I am just a guy, suffering from Asthma, who refuses to see his passion for travel die, due to it! Do you always follow tip #11 Yogesh? Yes. During my last trip to Ladakh i.e. first trip after getting Asthma, I didn’t drink throughout the trip. 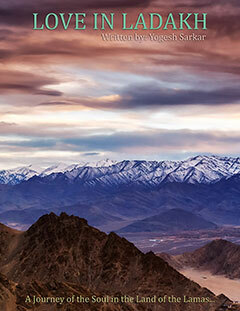 Why you should fly to Ladakh!